Last year, Sister Madly spent Halloween with Tallulah and (the now) Mr. Tallulah watching Disney propaganda films, the highlight of these being Der Fuehrer’s Face: a peculiar little picture chock-full of Nazi ridicule and an unfortunately catchy tune- so catchy, in fact, that Sister Madly had to forcibly stop herself from singing it in public. 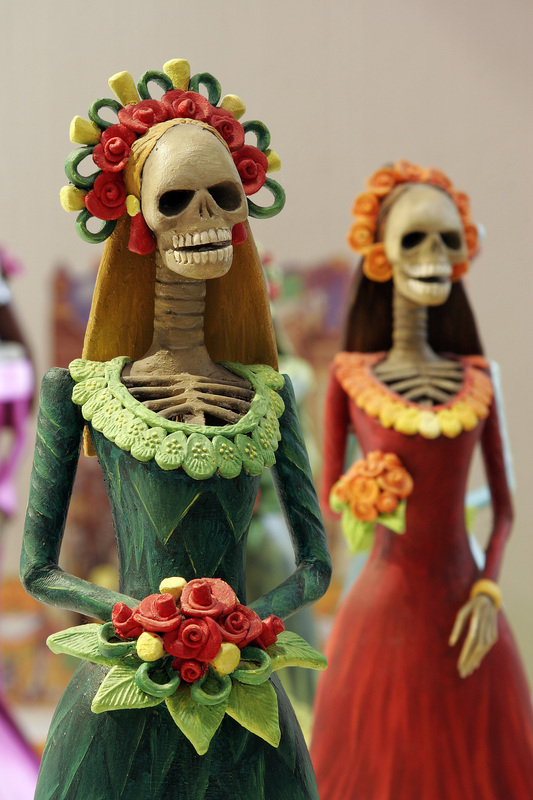 This year, the Professors have decided that not only should Sister Madly accompany their group to the party of a colleague, but that they should all attend said soiree dressed in a similar fashion- in this case, Día de los Muertos. This, for your FYI, was decided without the consent of Sister Madly, as these things usually are. Six weeks worth of protests have been met with the usual disregard as plans were made in her absence, which included elaborate costuming and makeup, with the finishing details to be outlined in temporary tattoo. Sister Madly sees no way in which this last one could possibly go wrong. 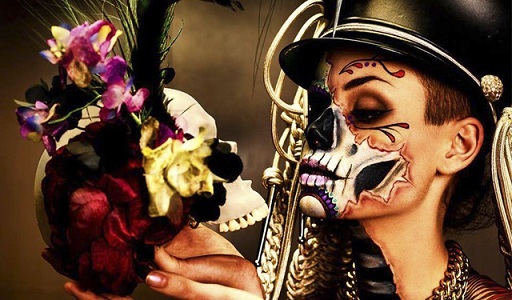 While never having made herself up in this grotesquely festive nature, Sister Madly is well aware of the drawbacks of unfamiliar cosmetic mediums, which stems from an incident that occurred well over 5 years ago. It happened when Sister Madly was 6 years-old, when she was still under the blissful delusion that there was no way in heaven and earth that she could possibly make a mistake. Her friend, Serafina, had invited her to a church party thrown as a ‘safe alternative’ to the usual Halloween festivities, which Sister Madly didn’t quite understand but decided to overlook as there was still the promise of candy. But with this promise came the gentle reminder that since the party was to be held at a church- and a strict, unfun denomination at that- their costumes had to be biblical in nature. So Serafina was going to be a pink, fluffy angel. And Sister Madly? She settled on the Devil. The Devil is biblical. But what, exactly, does the Devil look like? This was not something one covered in Sunday School, it turned out, as Serafina balked at the question. 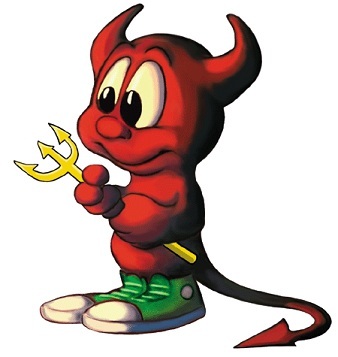 What they did know of the Devil was gleaned from the usual media outlets: red, naturally, as most depictions agree on this, with horns, a tail, maybe some fangs, and occasionally brandishing a pitchfork. While a 6 year-old’s standards aren’t very high, Sister Madly was disappointed at what was guaranteed to be her lack of authenticity. She would have to forgo any and all genetic mutations, and as for that pitchfork thing- that was just out of the question. No; if Sister Madly wanted to be the Devil, she would have to make do by simply being red. Unlike the other features, being red was something she could achieve. One Christmas not too long before, she received an inkpad and a stamp of her name surrounded by hearts (there was a time her parents thought it was a good idea for Sister Madly to possess such an instrument of destruction.) There had been some rules laid out at the onset, such as no stamping the walls or the carpet or the dog, but nowhere in these unwritten bylaws was the stipulation that Sister Madly could not stamp her own person if she so desired (nor, incidentally, the inside of the closet door… or the nightstand drawer… or the underside of her desk… or the swing set.) Not that Sister Madly always did what she was told, but she rather liked the stamp at that time and didn’t want it to be taken from her. And so Sister Madly made herself red by stamping her name all over her face. In the end, it was all in vain; Sister Madly never went to this Safe Alternative Halloween Party, and by all accounts doesn’t remember being all that upset about it. And while Sister Madly wandered around with the subtle imprint of her name all over her face for days after, no one ever thought to ask what impulse brought about this latest act of personal vandalism. It was merely chalked up as one of those things a young Sister Madly thought was a good idea at the time. This entry was posted on October 30, 2014 by Sister Madly. It was filed under Life and was tagged with blogging, culture, dark, entertainment, halloween, horror, humor, Life, misadventure, sister madly, weird, writing. That’s the plan for this Halloween, of which I have yet to decide whether or not I’m participating. This back story is so valuable for Sister Madly’s psychological profile that I’m assembling…please tell me more…. Don’t you think that pulling the wings off a housefly would be a better way to spend your free time? Fascinating. Disturbing, but fascinating…You’ve just added a couple of pages of analysis to your profile….Tell me more – do you indulge in this dark, dismemberment humor only around Halloween, or is this a consistent feature? This was a most practical suggestion. A big, dumb housefly without wings is much easier to kill than one that seeks pleasure in buzzing about your head just out of reach. Seriously, if you pulled the wings off them all, slaughtering them would be so much less destructive as there would be no need to punch a hole in the drywall. I hearing you say that your annoyance with obtuse individuals that take delight in pestering your mind with confusing questions often leads to the desire to lash out physically….am I reading you accurately? Complete and utter nonsense… at least somewhat… I plead the Fifth. So there. I LIKE BUTTERFLIES!!! AND FIREFLIES!!! I AM A HAPPY PERSON!!! I stand corrected, my adorable Sister. Just send me your address and I’ll be over at 2:20 am for the Spackling. Sympathy for the Sister. Do let us know how it goes/went. Will do. I have 24 hours to come up with an alternative plan, such as moving to a distant planet. Or something. My siblings are constantly telling me that I was found in a cabbage patch. I find no evidence of this. Then again, it could account for my distaste of leafy things and why eating them conjures up a vague thought of cannibalism. Contrary to popular wisdom, some things really are better left unknown. I respect Sister Madly’s judgment in this matter, however there are not nearly enough good cannibalism posts on the interwebs. That’s true. Cannibalism is sadly under represented in this day and age. Perhaps we should take a moment to appreciate this ancient practice. Have to say, having your name stamped across your body repeatedly is a pretty neat creepy do-it-yourself bit of costuming. If I ever went to a party with people who had any idea who I was I might try it sometime. Yes, that would be creepy- really creepy, actually. Maybe add a UPC label or a bio-hazard symbol for greater complexity. The effervescent mind is wonderful thing to behold. Or is that ever ‘fessing? Could be the remnants of that “un-fun denominational” scare as a child. The Devil in, “The Season Of The Witch”? What were you thinking Sister Madly? Blissful delusion? Are you too visiting a tea shop in Negril? Feeding your head so to speak? One vitally important thing stands out to someone who has attended a couple Day Of The Dead rituals and is also a hungry hungry sort. Will the cuisine be Sonoran? Can you arrange delivery? Chile Relleno. Tacos al Pastor. Burritos, the corn husk wrapped ones not those banana leaf wrapped ones! Soft Tortillas as a delivery mechanism for the green sauce and the Pico De Gallo please and thank you! Don’t make me send a spirit after you! If only it were a Day of the Dead celebration- but it’s a Halloween one with a lot a people I either don’t know or couldn’t care less about. And a group of irritating friends who are calling me at this very moment, wondering where I am. I hope the security door holds out. And I enjoy blissful delusions. And hard cider. I’ll be enjoying that all night. Gotta watch what my fingers say more closely. Multitasking, I blame multitasking! Tamales not Burritos! Tamales corn husk wrapped. Blissful Delusions, I can work with that and will. Then I guess I’ll just hang a picture over that hole in the wall. Don’t cover up that hole on my account. Here’ s little ditty to make your mind off the security door. 😀 Yes, that did, indeed, take my mind off the security door! Ha! That was a good story. I once had a child that somehow acquired a red bingo stamp. Naturally she was covered in red spots so I assumed small pox, the bubonic plague, some dreaded disease. Apparently she had an allergy to the ink, so when I washed it off she was still left with a pox in the spot. We spent about a week horrifying people in the grocery store with this obviously spotted and contagious child. When ever someone would ask her if she was feeling okay she’d just say, “bingo,” as if that explained everything which it did. Must be a natural instinct for a kid to stamp themselves (‘Bingo- love it! :D ) Unfortunately, I couldn’t claim bubonic plague as any skin reaction would have been in the shape of my name. Dead giveaway.